Davos (UK: /ˈdævɒs, dɑːˈvɒs/, US: /dɑːˈvoʊs/, German: [daˈfoːs] or [daˈvoːs] (listen); Romansh: Tavau; archaic Italian: Tavate) is an Alpine town, and a municipality in the Prättigau/Davos Region in the canton of Graubünden, Switzerland. It has a permanent population of 10,937 (2017). Davos is located on the river Landwasser, in the Rhaetian Alps, between the Plessur and Albula Range at 1,560 m (5,120 ft) above sea level. The former Alpine resort village consists of two parts: Davos Dorf (literally: "Davos village") to the northeast towards Klosters and further down through the Prättigau to Landquart, and Davos Platz (literally: "place") to the southwest, which opens into the valley of the river Landwasser and eventually leads to Filisur. During summer season the Flüela Pass leads south-east into the Lower Engadine. Davos plays host to the World Economic Forum (WEF), an annual meeting of global political and business elites (often referred to simply as "Davos"), and has one of Switzerland's biggest ski resorts. At the end of every year it serves as the site of the annual Spengler Cup ice-hockey tournament, hosted by the HC Davos local hockey team. The current settlement of the Davos area began in the High Middle Ages with the immigration of Rhaeto-Romans. The village of Davos is first mentioned in 1213 as Tavaus. From about 1280 the barons of Vaz allowed German-speaking Walser colonists to settle, and conceded them extensive self-administration rights, causing Davos to become the largest Walser settlement area in eastern Switzerland. Natives still speak a dialect that is atypical for Graubünden, showing similarities with German idioms of western parts of Switzerland, especially the Upper Valais. During the natural ice era of winter sports, Davos and the Davos Eisstadion were a mecca for speed skating. Many international championships were held here, and many world records were set, beginning with Peder Østlund who set four records in 1898. The only European Bandy Championship was held in the town in 1913. Subsequently, Davos became a ski resort, especially frequented by tourists from the United Kingdom and the Netherlands. After peaking in the 1970s and 1980s, the city settled down as a leading but less high-profile tourist attraction. Davos has an area (as of the 2004/09 survey) of 284 km2 (109.65 sq mi). Of this area, about 35.0% is used for agricultural purposes, while 22.2% is forested. Of the rest of the land, 2.3% is settled (buildings or roads) and 40.5% is unproductive land. In the 2004/09 survey a total of 337 ha (830 acres) or about 1.2% of the total area was covered with buildings, an increase of 61 ha (150 acres) over the 1985 amount. Over the same time period, the amount of recreational space in the municipality increased by 10 ha (25 acres) and is now about 0.22% of the total area. Of the agricultural land, 1,296 ha (3,200 acres) is fields and grasslands and 9,056 ha (22,380 acres) consists of alpine grazing areas. Since 1985 the amount of agricultural land has decreased by 736 ha (1,820 acres). Over the same time period the amount of forested land has increased by 481 ha (1,190 acres). Rivers and lakes cover 285 ha (700 acres) in the municipality. Until 2017 the municipality was located in the Davos subdistrict of the Prättigau/Davos district, after 2017 it was part of the Prättigau/Davos Region. It is in the Landwasser Valley. In terms of area, it was the largest municipality in Switzerland until the formation of the municipality of Glarus Süd in 2010, and is the largest in the canton of Graubünden. It consists of the village of Davos, with its two parts Davos Dorf (Davos-Village, northeast) and Davos Platz (Davos-Place, southwest), and the villages Frauenkirch, Davos Glari, Davos Wiesen, Davos Monstein, and Davos Clavadel, and the hamlets of Laret, Wolfgang, Obem See, Meierhof, Stilli, Bünda, and Spina in the main valley. In the side valleys there are additional hamlets including Tschuggen, Dörfji, In den Büelen, Hof, Teufi, Gadmen, Am Rin, Dürrboden, Sertig Dörfli, Oberalp, Inneralp. Davos lies in a high valley, the connection to Klosters needing the Wolfgang Pass of only some 70 metres ascent from Davos Dorf. This tiny pass results in a flow direction of the river not corresponding to the main traffic routes of road and Rhätische Bahn to the northeast but flowing in a southwesterly direction. Three long side valleys reach out to the south from the main valley. Davos has a subarctic climate (Köppen Dfc) with an average of 124.7 days of precipitation per year and on average receives 1,022 mm (40.2 in) of precipitation. The wettest month is August during which time Davos receives an average of 148 mm (5.8 in) of precipitation. During this month there is precipitation for an average of 13.5 days. The month with the most days of precipitation is June, with an average of 13.6, but with only 126 mm (5.0 in) of precipitation. The driest month of the year is April with an average of 56 mm (2.2 in) of precipitation over 9.6 days, of which 50.9 cm (20.0 in) in 8.5 days are snowfall. Davos with the Vaillant Arena (center). Davos has a population (as of December 2017) of 10,937. As of 2014, 27.0% of the population are resident foreign nationals. In 2015 7.3% of the population was born in Germany and 6.9% of the population was born in Portugal. Over the last four years (2010-2014) the population has changed at a rate of -0.27%. The birth rate in the municipality, in 2014, was 9.1, while the death rate was 8.2 per thousand residents. Most of the population (as of 2000) speaks German (86.3%), with Serbo-Croatian being second most common (2.8%) and Italian being third (2.7%). In Davos about 74% of the population (ages 25–64) have completed either nonmandatory upper secondary education or additional higher education (either a university or a Fachhochschule). Davos's ice hockey team, HC Davos, plays in the National League (NL). Their home arena is the Vaillant Arena. 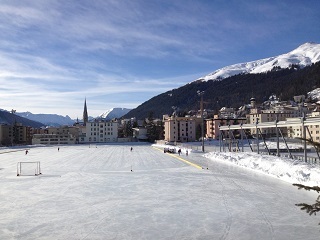 Besides cross-country skiing, offering some 97 km (60 mi) of pistes, Davos has the largest natural ice skating field in Europe. Bandy is occasionally played there. An international tournament, starting in 2014, has been organised. The 1913 European Bandy Championships in Davos is so far the only one of its kind. Davos is home to seven sites that are listed as Swiss heritage sites of national significance. These heritage sites include the Town Archives, the Kirchner Museum, the Grosses Jenatschhaus (a type of charity house known as a Pfrundhaus) and the Forest Cemetery (Waldfriedhof). Several hotels and spas are also included on the list. The three hotels or former hotels are: Berghotel Schatzalp, the former Grand Hotel Belvédère, and the Zürcher Höhenklinik von R. Gaberel. Davos is part of the rail network of the Rhaetian Railway (RhB). The RhB has two main stations in Davos: Davos Dorf (Rhaetian Railway station) (northeast) and the Davos Platz (Rhaetian Railway station) (southwest). Further Rhb also calls Davos Wolfgang and Davos Laret towards Klosters, and Davos Frauenkirch, Davos Glaris, Davos Monstein, and Davos Wiesen towards Filisur. The bottom station of the lift to Rinerhorn is right next to RhB station Davos Glaris. The one (Dörfji) of the Pischa area in the side valley of the Flüela, reachable by bus. Davos has several research institutes: the AO Foundation focusing on trauma and disorders of the musculoskeletal system, the Swiss Institute of Allergy and Asthma Research (SIAF), the World Radiation Center (PMOD/WRC) and the Institute for Snow and Avalanche Research (SLF) of the Swiss Federal Institute for Forest, Snow and Landscape Research (WSL). ^ "Davos". Collins English Dictionary. HarperCollins. Retrieved 8 April 2019. ^ "Davos". Oxford Dictionaries. Oxford University Press. Retrieved 8 April 2019. ^ "Davos". The American Heritage Dictionary of the English Language (5th ed.). Boston: Houghton Mifflin Harcourt. 2014. Retrieved 8 April 2019. ^ Boesch, Bruno, ed. (1957). Die Aussprache des Hochdeutschen in der Schweiz. Eine Wegleitung (in German). Zürich: Schweizer Spiegel Verlag. p. 36. ^ Eva-Maria Krech; Eberhard Stock; Ursula Hirschfeld; Christian Anders Lutz, eds. (2009). Deutsches Aussprachewörterbuch (in German). Berlin: Walter de Gruyter. p. 432. ISBN 978-3-11-018202-6. Retrieved 29 January 2016. ^ Davos in German, French and Italian in the online Historical Dictionary of Switzerland. ^ "Alexander Spengler Davos Klosters". ^ "Switzerland". 28 October 2009. ^ Swiss Federal Statistical Office - Amtliches Gemeindeverzeichnis der Schweiz - Mutationsmeldungen 2016 accessed 16 February 2017. ^ a b "Climate Normals Davos, Reference period 1981–2010" (PDF). Climate diagrams and normal values per stations. Zürich Airport, Switzerland: Swiss Federal Office of Meteorology and Climatology (MeteoSwiss). 2 July 2014. Retrieved 30 December 2015. ^ "Fraktionsgemeinden" (official website) (in German). Davos, Switzerland: Gemeinde Davos. Retrieved 30 December 2015. ^ a b "Kleiner Landrat" (official website) (in German). Davos, Switzerland: Gemeinde Davos. Retrieved 23 June 2017. ^ "Wahl Kleiner Landrat" (PDF) (official website) (in German). Davos, Switzerland: Gemeinde Davos. 6 June 2016. Retrieved 23 June 2017. ^ "Grosser Landrat" (official site) (in German). Davos, Switzerland: Gemeinde Davos. Retrieved 23 June 2017. ^ "Wahl Grosser Landrat" (PDF) (official website) (in German). Davos, Switzerland: Gemeinde Davos. 6 June 2016. Retrieved 23 June 2017. ^ "Nationalratswahlen 2015: Stärke der Parteien und Wahlbeteiligung nach Gemeinden" (XLS) (in German and French). Neuchâtel, Switzerland: Swiss Federal Statistical Office FSO. 9 March 2016. Retrieved 23 June 2017. ^ "Bandy field at the ice stadium". ^ Česká Asociace Bandy (24 February 2014). "Bandy Davos 2014 (Czech republic vs. Netherlands)" – via YouTube. 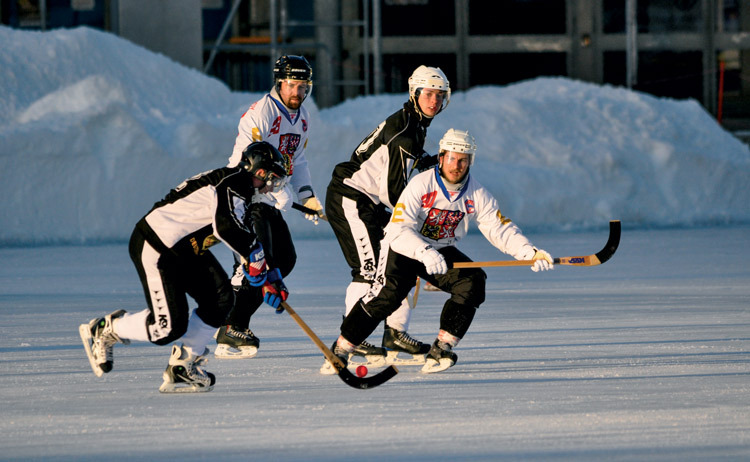 ^ "Czech Republic and Germany playing in the international bandy tournament 2014". Martin Bundi: Davos in Romansh, German, French and Italian in the online Historical Dictionary of Switzerland. The European Figure Skating Championships is an annual figure skating competition in which elite figure skaters compete for the title of European Champion. The 1899 Championships were held from January 14th to January 15th in Davos, Switzerland. Skaters competed only in the categories of men's singles. The competitors performed only compulsory figures. The World Figure Skating Championships is an annual figure skating competition sanctioned by the International Skating Union in which figure skaters compete for the title of World Champion. The 1910 men competitions took place from January 29th to 30th in Davos, Switzerland. The 1910 ladies competition took place on February 4th in Berlin, German Empire. There were only two competitors. The 1910 pairs competition took place on February 4th also in Berlin, German Empire. The 1922 European Figure Skating Championships were the European Figure Skating Championships of the 1921-1922 season. Elite senior-level figure skaters from European ISU Member Nations competed for the title of European Champion. Skaters competed in the discipline of men's singles.In 1922, the European Championships were held in Davos, Switzerland. The 1922 men competitions took place from February 5 to 6 in Stockholm, Sweden. The 1922 ladies competitions took place from February 4 to 6 in Stockholm, Sweden. The 1922 pairs competition took place on January 29 in Davos, Switzerland. The 1925 men and pairs competitions took place from February 14 to 15 in Vienna, Austria. The 1925 ladies competitions took place from January 31 to February 1 in Davos, Switzerland. The 1948 competitions for men, ladies, and pair skating took place from February 11 to 15 in Davos, Switzerland. These were the second World Figure Skating Championships after World War II. Skaters from Germany and Japan were still not allowed to compete. The 1953 competitions for men, ladies, pair skating, and ice dancing took place from February 8th to 15th in Davos, Switzerland. The 1959 European Figure Skating Championships were held in Davos, Switzerland. Elite senior-level figure skaters from European ISU member nations competed for the title of European Champion. Skaters competed in the disciplines of ladies' singles, men's singles, pair skating and ice dancing. The 1966 World Figure Skating Championships were held in Davos, Switzerland from February 22 to 27. At the event, sanctioned by the International Skating Union, medals were awarded in men's singles, ladies' singles, pair skating, and ice dance. Davos Seaworth, nicknamed the Onion Knight, is a fictional character from the A Song of Ice and Fire series of epic fantasy novels by American writer George R. R. Martin. He is a point-of-view character in A Clash of Kings, A Storm of Swords and A Dance with Dragons with a total of 13 chapters. Davos is portrayed by Irish actor Liam Cunningham in the HBO television adaptation Game of Thrones. Hockey Club Davos is a professional Swiss ice hockey club based in Davos, Switzerland. Davos plays in the National League (NL). The team is usually a strong force in the league and often bolster their roster with Swiss national team players and players who once played for National Hockey League teams. HC Davos also has hosted the annual Spengler Cup tournament, an invitational competition, since 1923. It is generally referred to by its abbreviation "HCD" by the fans. The team had the lowest attendance of the National League for the 2016–17 season, averaging 4,792 spectators over their 25 regular season home games. The second season of the American web television series Iron Fist, which is based on the Marvel Comics character of the same name, follows Danny Rand / Iron Fist, a martial arts expert with the ability to call upon the power of the Iron Fist. It is set in the Marvel Cinematic Universe (MCU), sharing continuity with the films and other television series of the franchise. The season was produced by Marvel Television in association with ABC Studios, with Raven Metzner serving as showrunner. Finn Jones stars as Rand, who protects New York following the events of The Defenders. Jessica Henwick, Tom Pelphrey, Jessica Stroup, and Sacha Dhawan also return from the first season to star, and are joined by Simone Missick, reprising her role from previous Marvel Netflix series, and Alice Eve. The season was ordered in July 2017, with Metzner replacing Scott Buck as showrunner. Filming for the season began in late 2017 in New York City, and continued until May 2018. Focus was placed on improving the fight sequences for the series after criticisms of the first season, with Clayton Barber taking over as fight coordinator after doing so for the MCU film Black Panther. Each episode in the season is named after a comics issue that Rand has appeared in. The season was released on September 7, 2018, and consists of ten episodes. The season received mixed reviews from critics, but was considered a major improvement over the previous season. Netflix canceled the series on October 12, 2018. Melisandre of Asshai is a fictional character in the A Song of Ice and Fire series of fantasy novels by American author George R. R. Martin and its television adaptation Game of Thrones. She is a priestess of the god R'hllor (also called the Red God or the one true god) from the continent Essos and a close advisor to King Stannis Baratheon in his campaign to take the Iron Throne. She is often nicknamed The Red Woman due to the color of her hair and clothes. Introduced in A Clash of Kings (1998), Melisandre has come to Westeros to propagate her faith in the Red God. She subsequently appeared in Martin's A Storm of Swords (2000) and A Dance with Dragons (2011). Melisandre is not a point-of-view character in the first four novels, her actions are witnessed and interpreted through the eyes of other characters such as Davos Seaworth and Jon Snow. In the fifth novel A Dance with Dragons, she has a single point-of-view chapter. George R. R. Martin stated she will return as a viewpoint character in future novels.Melisandre is portrayed by Dutch actress Carice van Houten in the HBO television adaptation. The National League (NL) is a professional ice hockey league in Switzerland. It is the top tier of the Swiss hockey league system and of the two-tier National League. Prior to the 2017–18 season, the league was officially called National League A. The NL has the most attended hockey club in Europe, SC Bern, and is also the most attended league within the same continent, averaging 6,882 spectators for the 2016–17 season. The Spengler Cup is an annual invitational ice hockey tournament held in Davos, Switzerland. First held in 1923, the Spengler Cup is often cited as the oldest invitational ice hockey tournament in the world. The event is hosted by the Swiss team HC Davos and played each year in Davos, Switzerland, from December 26 to 31 inclusively. Currently, all games are held at Vaillant Arena. It was originally devised by Dr. Carl Spengler as a means to promote teams from German-speaking Europe, who might have suffered ostracism in the aftermath of World War I. Eventually, the tournament grew well beyond expectations. Many of Europe's most prestigious clubs and national programs have appeared, including Soviet, Czechoslovak, Swedish, German, and Finnish powerhouses. Through its history, club or national teams from 12 different countries have won the tournament, with host team HC Davos and Team Canada winning the most cups (15) while Switzerland and Czechoslovakia are tied as nations whose various teams have won the most cups (19 each). Among non-European organizations, Team Canada, Team USA, nationally-ranked U.S. collegiate teams, reigning AHL Calder Cup and Ontario Hockey Association champions, and even Team Japan (in 1971, building international experience before playing as hosts of the 1972 Sapporo Winter Olympics) have competed for the Spengler Cup. Since at least 1990, Team Canada has been the only participant from North America, with the exception of the AHL's Rochester Americans in 1996 and 2013. In the 2018 tournament, Finnish club team KalPa from the city of Kuopio defeated Team Canada 2–1 in the final. The game was decided in the 8th round of a shootout, the first series of game-winning shots in tournament history that determined the winner of the Spengler Cup. Vaillant Arena (Eisstadion Davos) is an arena in Davos, Switzerland. It is primarily used for ice hockey and is the home arena of HC Davos. It holds 7,080 people, of which 3,280 are seated. Every year the Spengler Cup is played in this arena. Major renovation of the arena started at the conclusion of the 2017-18 season to upgrade most of the stands and the concourse. The seating capacity will not be increased and the total cost should be around CHF 21 million. Construction began in 2018 and is expected to be completed by 2021. The World Economic Forum (WEF), based in Cologny-Geneva, Switzerland, was founded in 1971 as a not-for-profit organization. It gained formal status in January 2015 under the Swiss Host-State Act, confirming the role of the Forum as an International Institution for Public-Private Cooperation. The Forum's mission is cited as "committed to improving the state of the world by engaging business, political, academic, and other leaders of society to shape global, regional, and industry agendas".The WEF hosts an annual meeting at the end of January in Davos, a mountain resort in Graubünden, in the eastern Alps region of Switzerland. The meeting brings together some 2,500 business leaders, international political leaders, economists, celebrities and journalists for up to four days to discuss the most pressing issues facing the world. The organization also convenes some six to eight regional meetings each year in locations across Africa, East Asia and Latin America, and holds two further annual meetings in China, India and the United Arab Emirates. Beside meetings, the organization provides a platform for leaders from all stakeholder groups from around the world – business, government and civil society – to come together. It also produces a series of research reports and engages its members in sector-specific initiatives.There have been many other international conferences nicknamed with "Davos". However, the World Economic Forum objected the use of "Davos" in such contexts for any event not organised by them. This particular statement was issued on 22 October 2018, a day before the opening of 2018 Future Investment Initiative (nicknamed "Davos in the desert") organised by the Public Investment Fund of Saudi Arabia.